When the Roller Derby was shut down I knew I had to find something else to make a living. Coincidentally I was approached by someone working for Ticketron who was leaving and starting a computerized ticketing system on a stand alone HP derivative computer, and would I be interested in the San Francisco Bay Area. What went on after that was a whole unbelievable story (Harold Silen and I putting up our houses, having to go to Denver first and ending up with software we found out had been shall we say used without the legal owner’s permission.) Somehow we overcame the problems and were up and operating by Fall 1974. Our main client, Bill Graham, was to give us all his rock and roll business, but ended up holding back and having us share with Ticketron until he was confident that our system could operate. The first big show we handled alone was “SNACK”, a concert at Kezar Stadium that Bill had put together with many of the top rock acts and MC’d by Marlon Brando and others to raise money for the arts in schools that even in 1974 were being cut back. There was only one tiny drawback to handling this massive (50,000 plus ticket) event; Bill wanted us to agree to donate our service charge (75 cents) to the cause. We did and then had to go to our stores that sold tickets to get them to go along with it. Many had to pay extra employees for ticket selling and bring in security, so they were not thrilled. Hal and I found out that our cost estimates were low, our revenue estimates high, and it took 7 years for us to break even in spite of having virtually all the sports, music, theatre and other entertainment tickets in the San Francisco Bay Area. One day I received a call from Barry Imhoff. Barry had worked for Bill Graham for years and took care of the major acts (Stones, Led Zeppelin, etc) when they were in the area. It turned out he had a super-secret tour coming up, and since I was the best ticket man he knew (probably the only one, and I had not been doing it long), he wanted me to come to New York, meet with him, and help set up the tour. I thought this would be a great way to really understand the rock and roll business which would become our major staple over the next 25 years. We were in the midst of a number of problems at BASS tickets, and Hal was not pleased when I said I probably would be gone for six weeks or so, but he said OK. When I met with Barry he swore me to secrecy and said this was going to be a Bob Dylan and Joan Baez tour, with other leading musicians (T-Bone Burnett, Roger McGuinn. Jack Elliott) with them, and others would join later for 1 or more nights (Joni Mitchell. Arlo Guthrie and many more.) Dylan was the promoter and Barry was working for him. Barry told me that Bob was fed up with the huge arenas tours and the difficulties that fans had in getting tickets. Therefore, there would be no computerized ticketing (!) 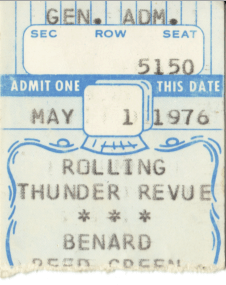 on this tour, and when I was shown the schedule I ordered pre-printed tickets from a bonded printer I knew with only the heading: Rolling Thunder Revue. No artists were listed. And there was to be no pre-publicity. I was given a mobile home, two assistants and told to go to the various cities one day ahead and hand out handbills announcing the tour. Well even in the 70’s this was an impossible way of promoting the tour, but I did as I was told. First we all were booked in a resort in Falmouth, Mass, in the Cape Cod area. Since this was November, no one else was there. Rehearsals were held in a conference center at the hotel and the musicians, technicians, personnel and those who traveled with them started to show up. Now with Roller Derby, we traveled with 28 skaters, a physical therapist, two referees (one drove the truck with the track in it), and a manager. The skaters and the referees set up and tore down the track, programs and novelties were in the truck, one skater made extra money by sewing and repairing uniforms, and skaters drove from place to place in cars, 3 to a car and they were paid mileage. This certainly was not rock and roll travel. At least 100 people showed up including wives, girlfriends, hangers on, etc and they all had to be housed and fed. The possible cost was overwhelming to me. Security traveled with them also. I made a number of friends including Tom Mooney whose wife Ann worked at Ticketmaster when I did in later years. Also Mike Evans handled security and other jobs and today he works as a leading figure in the company out of Philadelphia that owns or manages major arenas, theatres, and sports teams throughout the world. Rehearsals stared, and Alan Ginsburg also joined the tour. He played the triangle. The music I heard was great. I did not have much interplay with Dylan as he was either putting the show together or with his inner circle. Everyone seemed to get along fine. The local papers were getting curious about what was going on at the Hotel, and Barry and I were outside one night when a reporter approached and asked if he could go in. Barry told him no and he left. The next day in the local paper was a very dark photo of us with the caption “two hefty security guards keeping people from observing what is going on at the Falmouth Inn”…..I was upset, Barry was large but I certainly wasn’t hefty at the time. One day during rehearsals all the equipment had to be moved out of the hall as the hotel had pre-booked a canasta tournament. At a break in the action, the hotel manager came in and told the ladies they were in for a special treat: he had booked two folk singers for them, Bob Zimmeran and Al Ginsburg. Dylan came out played the piano and sang, Ginsburg played the triangle. I don’t think the ladies ever knew who they were. I will add part 2 to this blog tomorrow.